In advance of shuttle Endeavour's STS-126 mission to the station, managers from both programs discuss the flight. A detailed preview of Endeavour's mission to deliver expanded crew accommodations to the station is provided in this briefing. Four spacewalks are planned during Endeavour's STS-126 mission to the station. The Endeavour astronauts, led by commander Chris Ferguson, meet the press in the traditional pre-flight news conference. Space shuttle Endeavour switched launch pads on Oct. 23, traveling from pad 39B to pad 39A. The shuttle Endeavour is in good shape after its climb to space Friday and engineers are only working a handful of relatively minor problems, most noticeably glitches with the shuttle's KU-band antenna, the chairman of NASA's Mission Management Team said today. 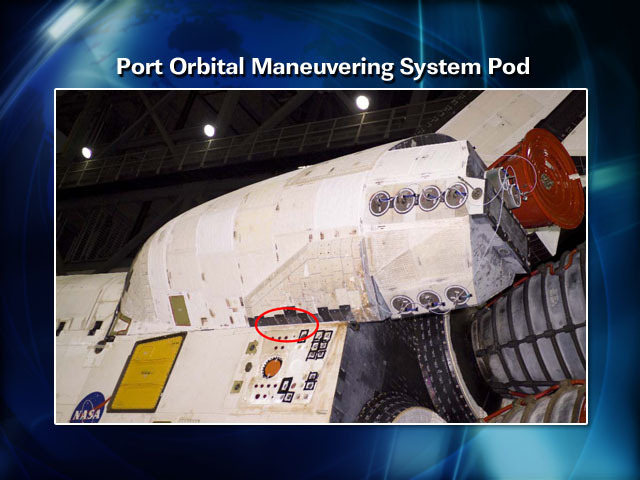 Based on an evening video inspection, a presumably lost strip of flexible insulation from the shuttle's left aft fuselage apparently is still in place. "The mission is going extremely well," said MMT Chairman LeRoy Cain. "The crew is in good shape as is Endeavour. ... There are a few very minor things that we have in work that the team is looking at but nothing of overall great significance. The space station program reported to us that the station is in good shape and the crew on board the station is ready for Endeavour and her crew to show up tomorrow." Cain said an analysis of imagery from Endeavour's night launch Friday is not yet complete, but poor lighting means a detailed assessment will have to wait until on-orbit inspections are completed later in the mission. The crew was told of two possible debris events late Friday, but Cain said today as far as he's concerned, only one event is currently under discussion. At roughly 28 seconds after launch, just before the shuttle's three main engines throttled back to 72 percent thrust to ease aerodynamic loads on the vehicle, a piece of debris of some sort, possibly a small strip of flexible reusable surface insulation, or FRSI, appeared in close-up tracking camera footage in the area right above the shuttle's left-side aft umbilical connection plate just below the left orbital maneuvering system rocket pod. Some images pre-launch photos showing the blanket can be seen here and here. A tracking camera shot of the debris is available here. "We have one area that we're looking at from a debris standpoint," Cain said. 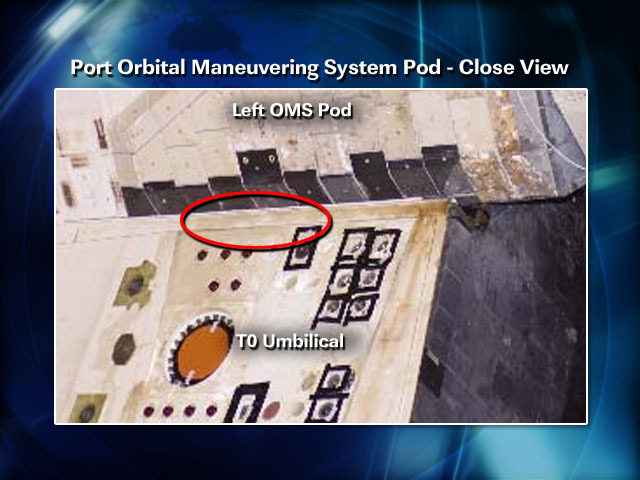 "Just underneath the left OMS pod, in the area right above the T-0 umbilical plate, there is what we think is a narrow strip of the blanket insulation material that came loose and flew away there. ... This is not an area that is of great concern to us in terms of losing a blanket. As I said, the umbilical plate itself is an aluminum surface that is unprotected by any thermal protection system." Just after 6 p.m. today, the astronauts took a moment to aim a camera on the shuttle's heat shield inspection boom to photograph the area. To the untrained eye, no obvious damage was apparent and at an 8 p.m. mission status briefing, lead flight director Mike Sarafin said the insulation in that area appeared to be intact and "there's no apparent damage there." "To me, I saw the launch imagery at 28 seconds, it looked like something was clearly there, it wasn't there in a previous frame or two of the ascent imagery," Sarafin said. "What the root cause of that is, I'll wait until we get all the imagery data on the ground." FRSI insulation is used in areas of the shuttle where re-entry heating does not exceed 700 degrees Fahrenheit. 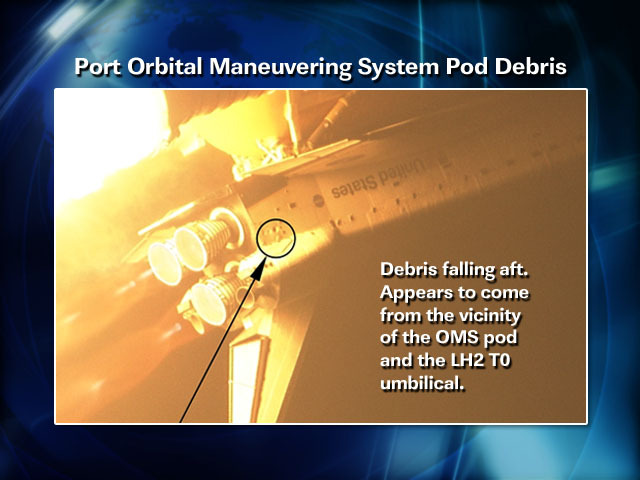 Engineers are continuing to study what the debris seen in the launch video might have been. Cain mentioned two problems with the shuttle's KU-band antenna, a steerable dish antenna mounted near the front right side of the ship's payload bay that automatically finds, locks onto and tracks NASA's data relay satellites. The antenna sends and receives data, voice communications and television signals and can operate in radar mode during rendezvous operations. In one problem, the antenna fails to maintain lock on a target satellite after getting initial pointing instructions from the shuttle's computers. Cain said flight controllers can work around the glitch by operating in what is known as GPC designate mode, in which pointing instructions are continuously sent to the antenna system. While this mode requires additional work by ground controllers, it is transparent to the shuttle's crew. The second problem involves trouble with automatic handover between KU- and S-band communications. Again, ground controllers will manually oversee such handovers as required with no impact on the mission. It's not yet clear what is causing the problems. If the loss-of-lock condition is located in the antenna electronics, Cain said, the KU system may not be able to operate in radar mode during Endeavour's rendezvous with the international space station Sunday. In that case, the crew will switch to a backup procedure and use the shuttle's star trackers to provide navigation data during the final stages of the rendezvous. Cain said all shuttle crews are trained to carry out star tracker rendezvous procedures in case of radar failures. "In my recollection, we've done at least one (star tracker rendezvous) in the space station assembly sequence, it was on STS-92 (in 2000)," Cain said. "We did exercise a radar-fail rendezvous on that mission."